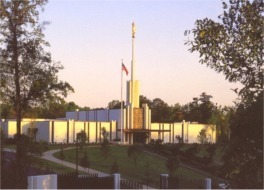 The Atlanta Georgia Temple is the 21st operating temple of The Church of Jesus Christ of Latter-day Saints. The First Presidency of the Mormon Church announced the building of the Atlanta Georgia Temple on April 2, 1980. It was the first Mormon temple to be built in the Southern United States, and met with opposition from the citizens in the region. During the early days of Mormon history the Church had a strong membership in Georgia. Mormon missionaries had proselyted in Georgia as early as 1843, but when Joseph Smith was martyred in 1844, missionary work slowed and then stopped by 1846. Mormon missionaries were asked to come back to the main body of members in Nauvoo. In 1878 Mormon missionaries returned to Georgia, and missionary work was greeted with success. Rome and Axson, Georgia, were often referred to as "Little Utah" by many of the people in the area. But the members and missionaries in the area were persecuted, and the missionary work in Georgia was stopped again after a mob killed Joseph Standing, one of the missionaries. Most of the members in the area moved west to Utah to join the rest of the members of the Church. A groundbreaking ceremony and site dedication were held on March 7, 1981. The ceremony was presided over by Spencer W. Kimball, the President of the Church at the time. The temple site is 5.9 acres. The original design of the temple did not include a spire, but as construction progressed, a spire and ten-foot angel Moroni statue were added to the plans. The Mormon temple was open for public tours May 3rd through the 21st, 1983. Those who were able to tour the 35,360 square foot temple saw the four ordinance rooms, Celestial room, five sealing rooms, baptistry, and were able to learn more about Mormon beliefs related to the temple. Gordon B. Hinckley dedicated the Atlanta Georgia Temple on June 1-4, 1983, the first of dozens of temples President Hinckley would dedicate either as an apostle or as prophet. This was the first temple where the cornerstone ceremony became a part of the dedicatory services. Now this is done with all of the newly built temples. Gordon B. Hinckley rededicated the baptistry of the Atlanta Temple on November 14, 1997. The Atlanta Georgia Temple serves 50,000 members in 12 stakes from Georgia and Alabama. The Atlanta Georgia Temple was closed 1 July 2009 for renovation. Among the changes was the addition of large windows in the celestial room, adding more natural light, and art glass windows in other parts of the temple. Since the temple has been renovated, it was rededicated as a House of the Lord. Before the rededication, the temple was opened to the public for tours. The open house was scheduled from Saturday, 9 April 2011, until Saturday, 23 April 2011, excluding Sundays. The temple was formally rededicated on Sunday, 1 May 2011 in two sessions by Mormon Prophet Thomas S. Monson. Both of the rededicatory sessions were broadcast to congregations of the Church within the temple district. Hinckley, "God Grant Us Faith", October 1983 General Conference. This page was last edited on 24 January 2012, at 11:45.